Our 5 boutique bed and breakfast rooms opened in May 2017. All rooms have been decorated and furnished to a very high standard with Voyage Maison wall art and fabrics and Barker and Stonehouse furniture. Room rates include a hearty breakfast which is served downstairs in the cafe. Rooms 1 and 2 are dog friendly. Midweek offer, stay three nights Sunday-Thursday, bed and breakfast and get the third night free (30% off your stay), use discount code: winter. Weekend offer, stay Friday and Saturday, bed and breakfast for just £200 per room for two nights, use discount code: winterwarm. Situated at the front of the building decorated with Voyage Maison Cairngorm wallpaper and fabrics. All rooms are furnished with Barker and Stonehouse furniture. Room 1 can be set up as a twin or superking bed and has built in wardrobe, dressing table, bedside tables, armchair, window seat and coffee table, it's a first floor room looking out onto the front street. Well behaved dogs welcome in this room. Room 1 features: Twin or superking bed. Spacious ensuite bathroom with shower over bath. Luxury bed linen and towels. Tea, coffee, biscuits and fresh milk. Hairdryer. Ironing board and iron. First floor room. Smart TV. Free Wifi. The White Company toiletries. Situated at the front of the building decorated with Voyage Maison Rinjani wallpaper and fabrics. All rooms are furnished with Barker and Stonehouse furniture. Room 2 has a large wooden bed, built in wardrobe, dressing table, bedside tables, small sofa, window seat and coffee table, it's a first floor room looking out onto the front street. Well behaved dogs welcome in this room. Room 2 features: King size bed. Spacious ensuite bathroom with large shower. Luxury bed linen and towels. Tea, coffee, biscuits and fresh milk. Hairdryer. Ironing board and iron. First floor room. Smart TV. Free Wifi. The White Company toiletries. Situated at the back of the building decorated with Voyage Maison Jumanah wallpaper, this is our largest room. 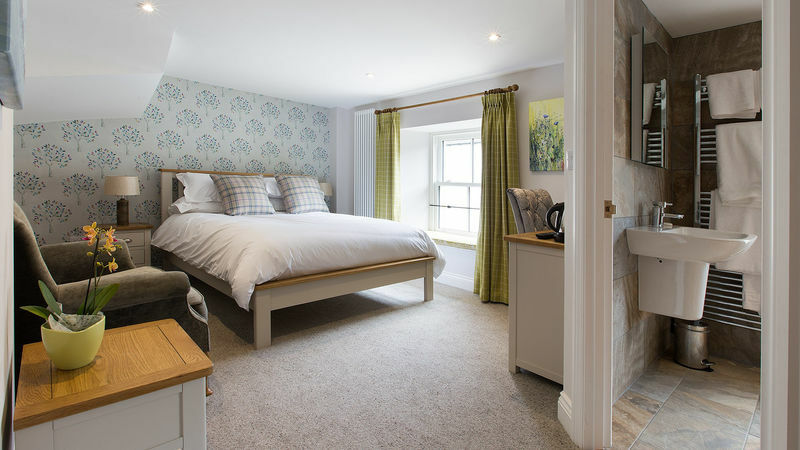 Rooms are furnished with Barker and Stonehouse furniture, room 3 has a large wooden king size bed, wardrobe, dressing table, bedside tables, two small armchairs and coffee table, it's a first first floor room looking out onto Bertram's courtyard. Any children booking into this room will be provided with a Z bed. Sorry no dogs in this room. Room 3 features: King size bed. Original Victorian window shutters. Spacious ensuite bathroom with shower over bath. Luxury bed linen and towels. Tea, coffee, biscuits and fresh milk. Hairdryer. Ironing board and iron. First floor room. Smart TV. Free Wifi. The White Company toiletries. Situated at the front of the building decorated with Voyage Maison Nelia wallpaper and fabrics. All rooms are furnished with Barker and Stonehouse furniture. Room 4 has a large wooden bed, wardrobe, dressing table, bedside tables, small sofa, two window seats and coffee table, it's a second floor room looking out onto the front street. Room 4 features: King size bed. Ensuite bathroom with large shower. High vaulted ceilings with exposed original wooden beams. Luxury bed linen and towels. Tea, coffee, biscuits and fresh milk. Hairdryer. Ironing board and iron. Castle view from window seat. Second floor room. Smart TV. Free Wifi. The White Company toiletries. Situated at the front of the building decorated with Voyage Maison Samui wallpaper and fabrics. All rooms are furnished with Barker and Stonehouse furniture. Room 5 can be set up as twin beds or a super king bed and has a fitted wardrobe, dressing table, bedside tables, armchair, window seat and coffee table, it's a second floor room looking out onto the front street. Room 5 features: Twin or super king size bed. 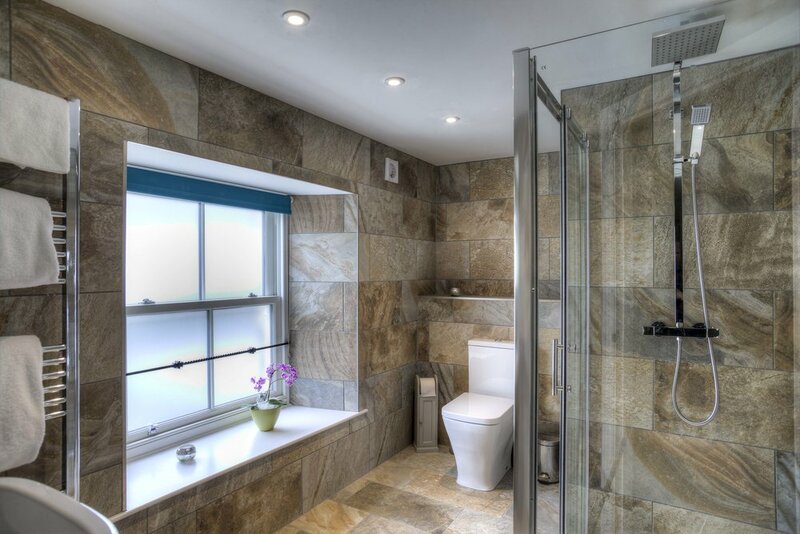 Ensuite bathroom with large shower. High vaulted ceilings with exposed original wooden beams. Luxury bed linen and towels. Tea, coffee, biscuits and fresh milk. Hairdryer. Ironing board and iron. Castle view from window seats. Second floor room. Smart TV. Free Wifi. The White Company toiletries. *T&Cs winter deals: Based on two people per room, valid for bookings until 31/03/2019, no refunds, date may be changed subject to our discretion, £15 dog cleaning fee applies.